Twelve of the photos appear on ABC's Web site. One photo shows a close-up of the upper floors of the burning towers. 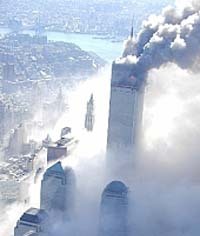 Others show the towers' dramatic collapse in a thick plume of smoke and debris and sweeping views of billowing smoke clouds.